I was biking through the Arlington neighborhood of Rosslyn today and took a picture of one of their new solar-powered trash compactors. 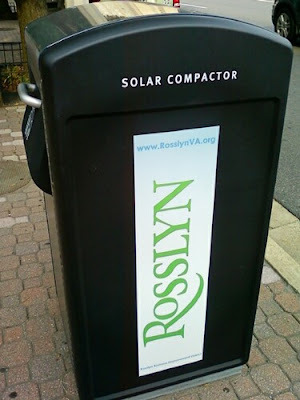 The Rosslyn Business Improvement District (BID) installed thirty Big Belly solar compactors recently. Click here for the press release.